Home » Travel » Central & eastern europe » From a Terrace in Prague. A very good bright copy. Spine lettered and ruled in gilt, Prague coat-of-arms in gilt to upper board. A little damp spotting to fore-edges and occasionally throughout otherwise a very nice copy. School prize label neatly to paste-down. Clean and tight. 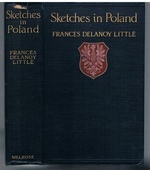 ; With 36 illustrations, of which four are colour plates, and one map.